Our guide to Faucets offers detailed descriptions of companies such as Gulfstream Whirlpool Bath and St. Thomas Creations. Sam's Club is the warehouse store chain of retailing giant Wal-Mart. Everything from portable garages and flooring to hot dogs and fresh flowers is sold to paid business and retail members only through the chain's website and physical stores. Brizo is Delta Faucet's luxury brand. High end kitchen and bath faucets are sold through dealers under the Brizo name. 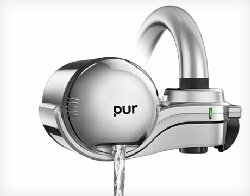 A Procter and Gamble company, Pur produces water filters for faucets, refrigerators, stand-alone pitchers, and undercounter systems. Horizontal mount faucet filter turns tap water into tasty.